Yesterday it was supposed to rain but instead it snowed. 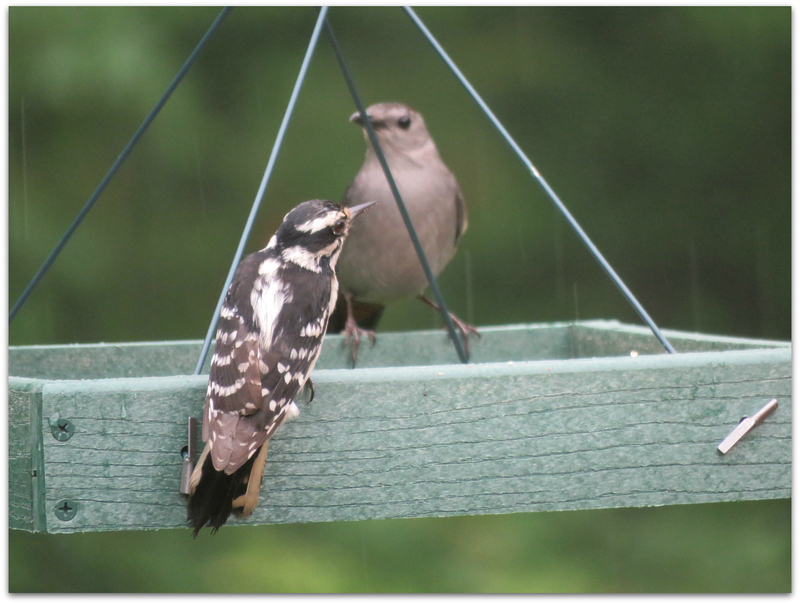 More birds come to our backyard and bird feeders when it’s snowing, what fun! This entry was posted in Uncategorized and tagged American Tree Sparrow, birds, Blue Jay, downy woodpecker, Northern Cardinal, Red-bellied Woodpecker, snow, White-breasted Nuthatch, winter on January 17, 2016 by Amy. Female Northern Cardinal with a Downy Woodpecker beyond. New Year’s Resolution: keep an eye on the birds. Goldfinches, male cardinal and chickadee. The feeders are busy when it snows. This entry was posted in Uncategorized and tagged American Goldfinch, birds, Black-capped Chickadee, downy woodpecker, New Year, Northern Cardinal, resolution on January 1, 2016 by Amy. 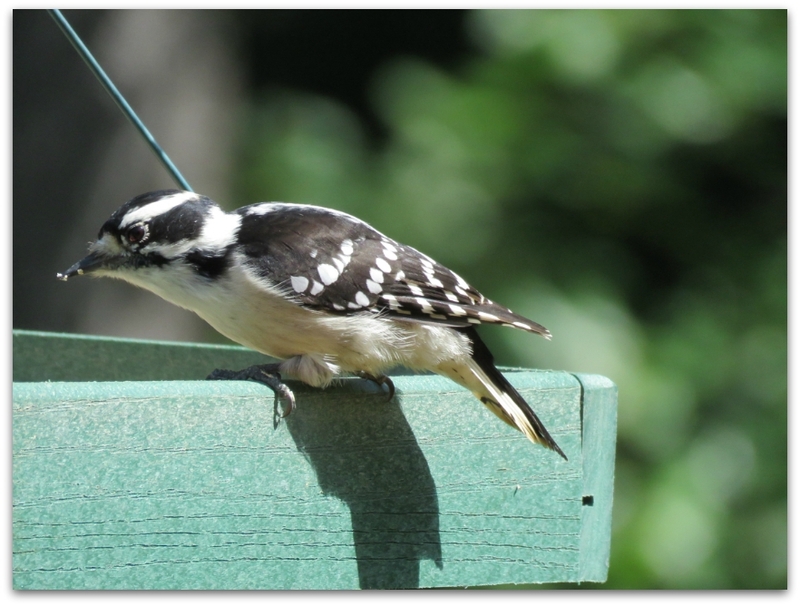 This entry was posted in Uncategorized and tagged backyard birds, Black-capped Chickadee, downy woodpecker, Tufted Titmouse, White-breasted Nuthatch on December 7, 2015 by Amy. 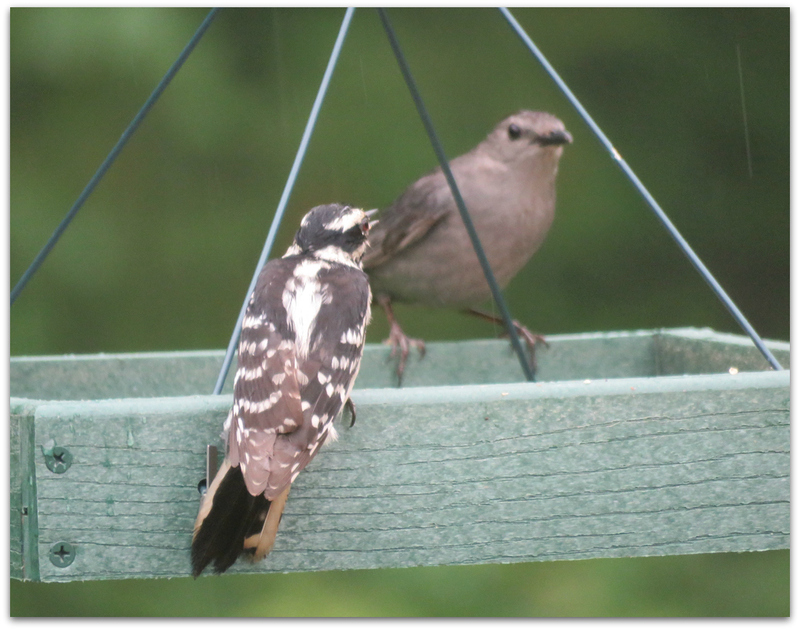 Dear little downy, the smallest woodpecker in North America. 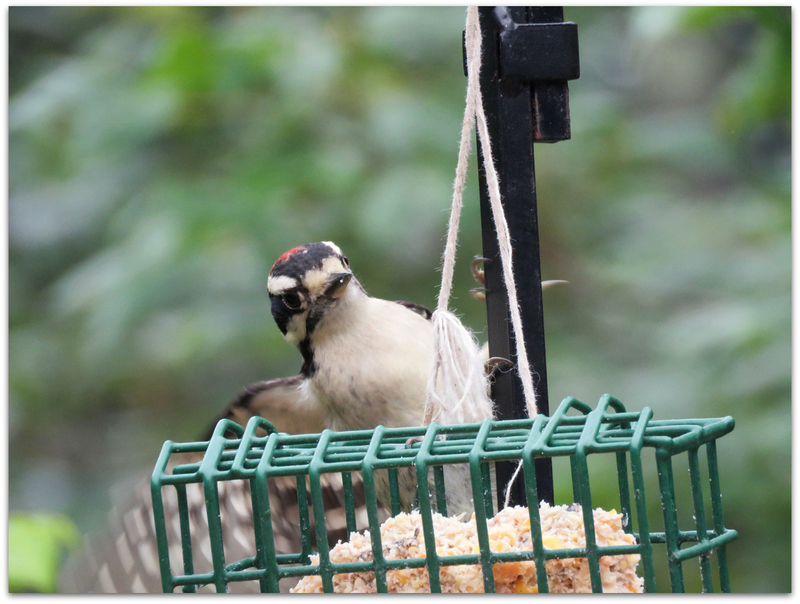 This year we have a bumper crop of these sweet and fairly tame woodpeckers. When they were fledging they were all over the place, accidentally and on purpose. 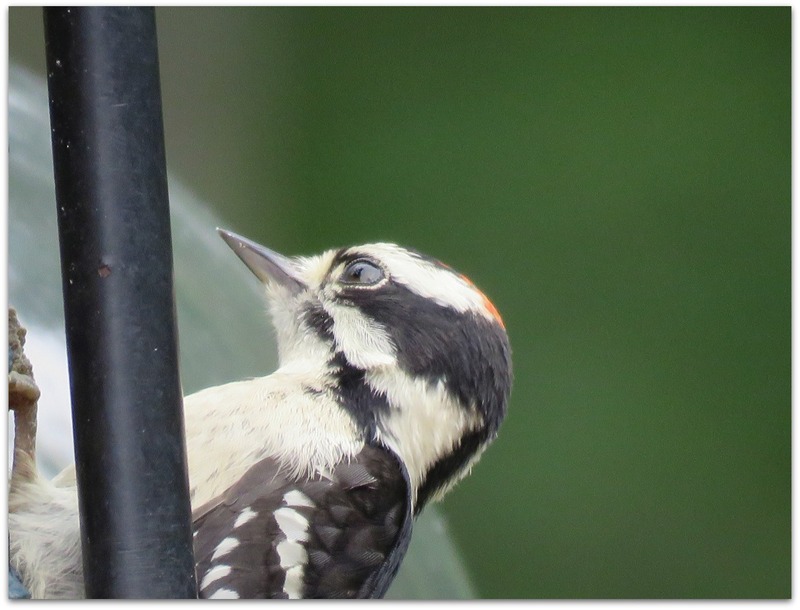 This one is a male, you can tell by the red patch on his head. They just love the Feathered Friend brand suet cakes I get at our local Agway. 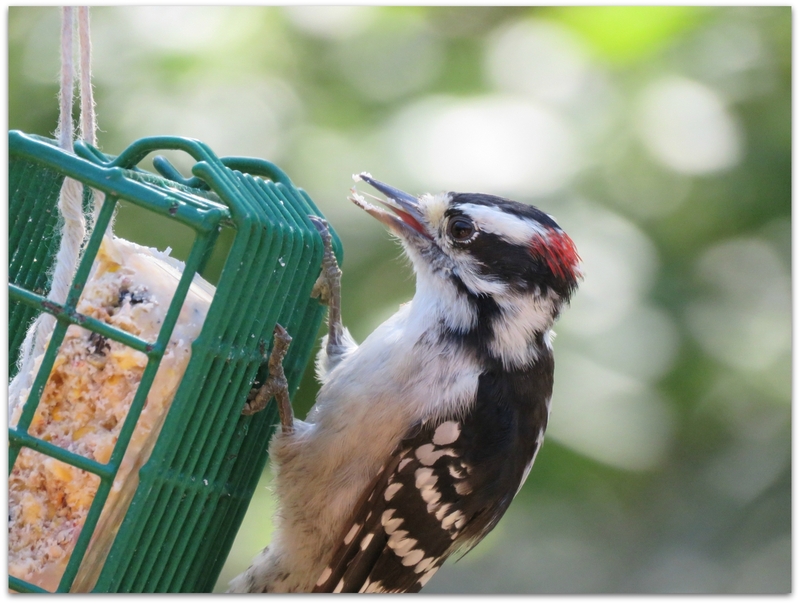 This female Downy Woodpecker is enjoying some homemade suet dough in the platform feeder. 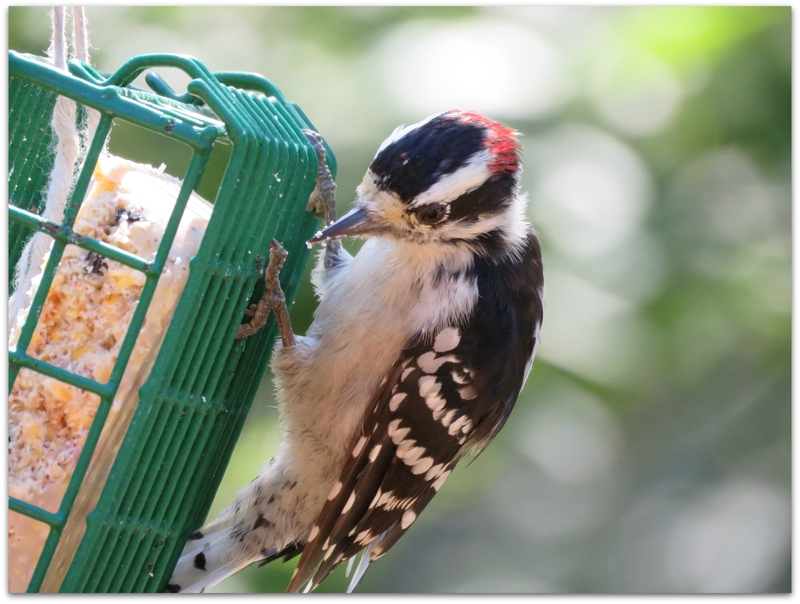 In addition to its popularity with backyard bird feeding enthusiasts, the Downy Woodpecker provides a valuable service to our ecosystems. Its preference for insects, especially wood boring larvae, is of great economic benefit as many destructive insects pests are consumed. Overall, census data indicates that populations are holding steady, although population declines are occurring in some areas. The availability of suitable nest sites plays an important role in population distribution. 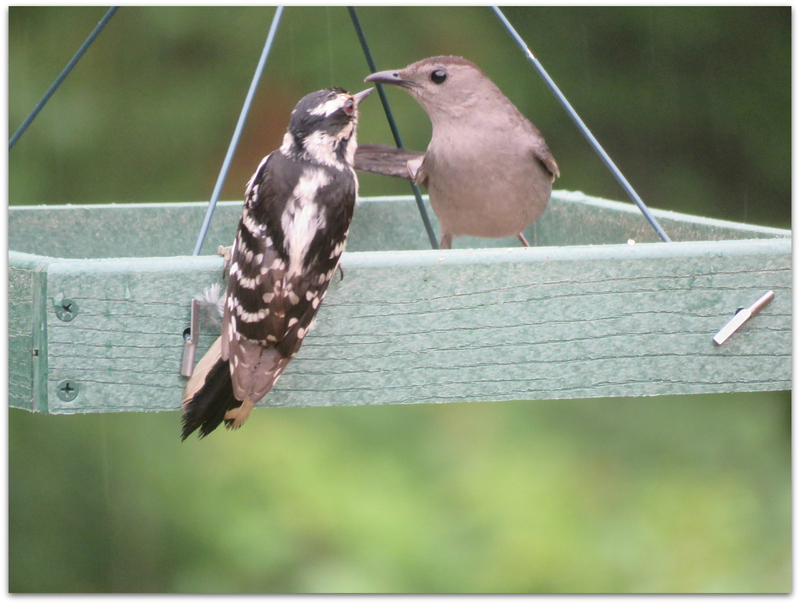 Managing woodlands to retain dead trees and snags for nesting will go a long way toward maintaining a healthy population of these and other cavity nesting birds. We certainly have plenty of dead trees out behind our house so I’m glad we never bother cleaning them up! 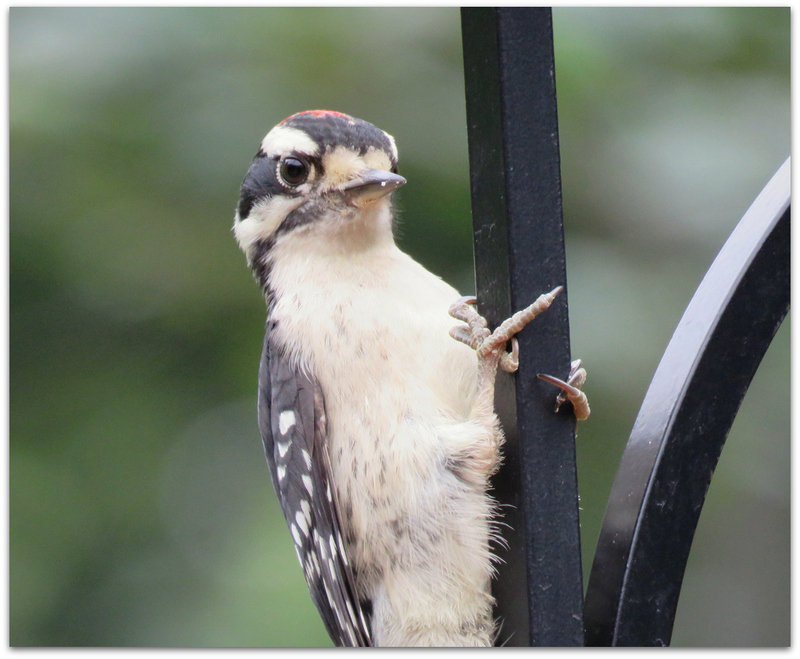 This entry was posted in Uncategorized and tagged backyard birds, birds, downy woodpecker on September 10, 2015 by Amy. 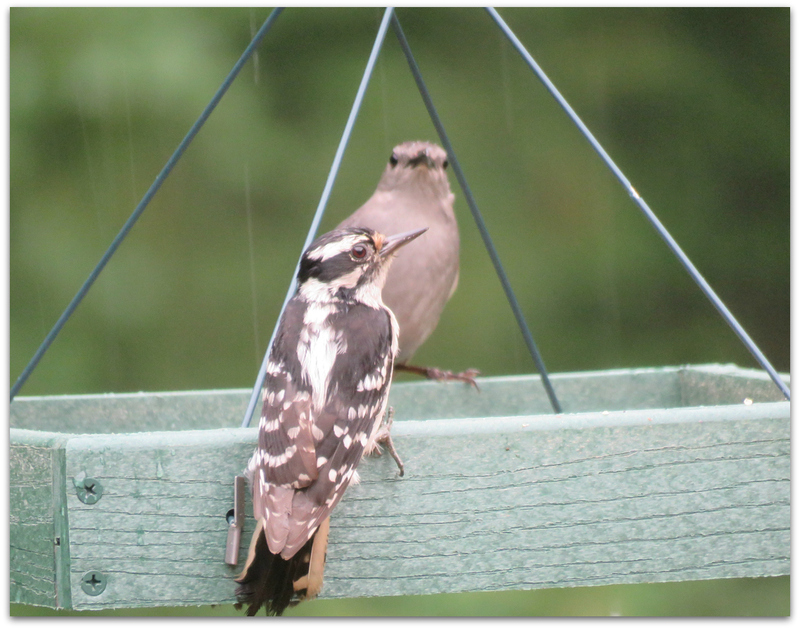 Downy Woodpecker fledglings are all over the place. 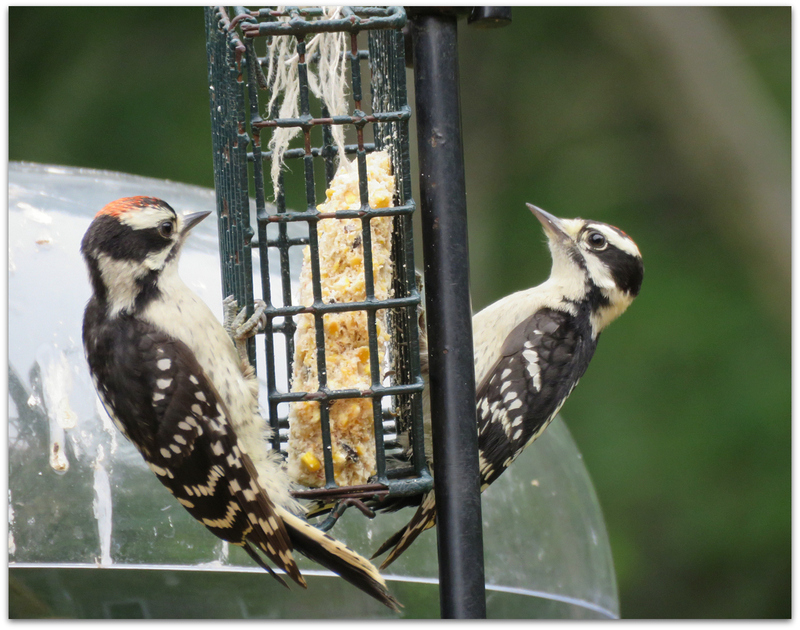 I sat in a deck chair and watched a two of them eating the last crumbs of suet that had fallen from the suet cake holder. 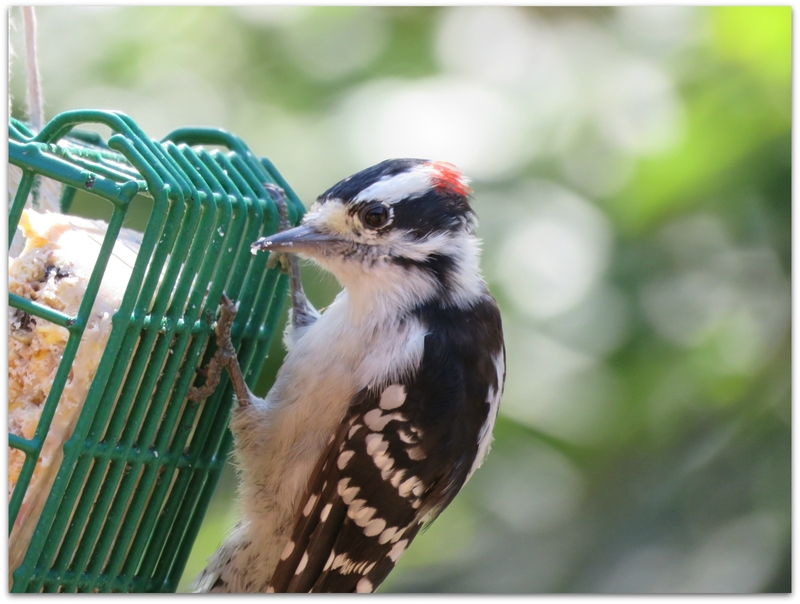 This entry was posted in Uncategorized and tagged downy woodpecker on July 3, 2015 by Amy.